I’m thankful this was brought up because this quote from the treaty is often taken out of context. Two responses are necessary. First, the quote above is partial. When taken in its full context, it becomes clear that the point the treaty was making was that, to paraphrase, “America is not found on the Christian religion in the same way prior countries were founded on it.” The point being, other European nations used Christianity as an excuse to wage war solely for religious reasons. Just being a Muslim would be reason enough for, say, 18th century England to wage war on you. We, as a new nation, were not founded on Christianity in that way. 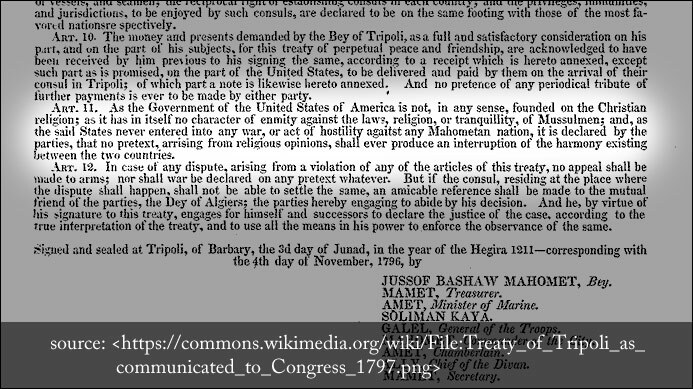 The Treaty of Tripoli was worded in this way to assure regional Muslims that American ships passing through the Mediterranean Sea were simply peaceful merchant ships intent on nothing more than economic trade and mutual benefit between trading nations. The words “as it has” mean everything here. We are not founded on Christianity in the sense that we hold hatred of the Muslims or intent to wage war. We are a different kind of Christian nation. “The general Principles, on which the Fathers Achieved Independence, were the only Principles in which that beautiful Assembly of young Gentlemen could Unite, and these Principles only could be intended by them in their Address, or by me in my Answer. And what were these general Principles? I answer, the general Principles of Christianity, in which all those Sects were united: And the general Principles of English and American Liberty, in which all those young Men United, and which had United all Parties in America, in Majorities sufficient to assert and maintain her Independence. Adams went on to say that the general principles of Christianity were so profound, even secular scholars had a hard time disagreeing with them! This and many more such quotes can be found by Adams and many other Founding Fathers pertaining to the Christian foundation of America. 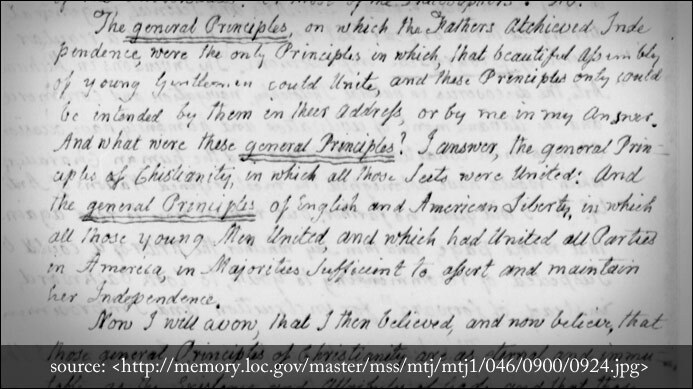 For a President who so adamantly stood firm in his conviction that America was founded on the “general principles of Christianity,” it would be shocking to think that a treaty endorsed by Adams would contain contrary language. I am sure that columnist Laurie Roberts is not trying to misquote history, she is simply another victim of the Progressive Agenda to rewrite the textbooks on American History with historical misrepresentation and omission. A talented writer, she pens many solid articles, but this one I have to disagree with. Thanks for posting this. I happened upon it while looking for information that may refute Richard Dawkins in his book, The God Delusion, where he quotes the Treat of Tripoli without having the context that you have so adequately provided. It is much appreciated!